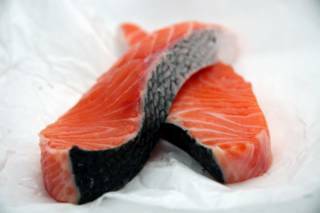 The Chowhound Bay Area Boards tipped me off about places where I could buy sushi grade salmon in the San Francisco area. Sushi grade Ahi isn't so difficult to source but the salmon seems more elusive. Places you might expect to be able to buy it like Wholefoods or The Ferry Building Plaza actually didn't stock it when I tried. From all of the Chowhound suggestions, I decided to journey over to Yum Yum's over in the Sunset district. It doesn't look much from the outside. 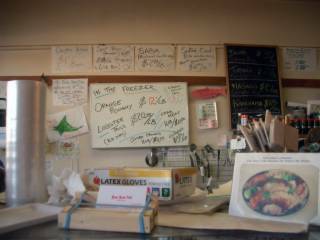 Large hand written boards alert you to what is fresh, what is frozen, what is on offer. The fish counter actually doesn't look all that special, but when I asked for a piece of "Centre-cut salmon", a new piece of fish was retrieved from the back of the store for me, by my charming French server. My recipe called for just 5 ounces of fish but when I saw how small it was, and how brightly it glistened, I asked him for another slice the same size. Fresh, beautiful and only $5 for these two superb slices of fish. It took a lot of will power not to gobble it straight down as I prepared my recipe. Yum Yum also serves sushi to go or to eat at one of the tiny tables nestled inside. 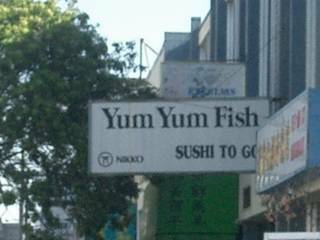 Yum Yum Fish is a real gem, great place thanks for reminding me! 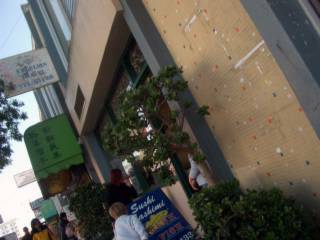 When you are out in that area check out Arizmendi Bakery on 9th between Judah and Irving. They have a very unusual and delicious pizza (like the Cheeeseboard in Berkeley) The bakery has lots of other good stuff and was named best by SF Bay Guardian this year. 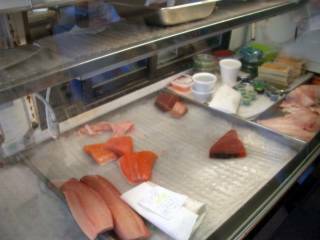 The Tokyo Fish Market on San Pablo Avenue just north of Gilman, in Berkeley, is a great place to get sashimi grade fish. Always very fresh, and the people are really nice. I don't get to berkeley so often, but I'll make a note to try it next time. Anyone know of another good fish store in the City? i simply wanted fresh tuna so i could prepare some tuna tartar tonight. i called 30 minutes before hand to ask if their tuna was fresh enough so i could make my tartar tonight and when it was shipped to them. yes, and this morning. pleased, i picked some up and brought it home to find it SMELLY AND SOFT. i returned to their fish market 20 minutes later for a refund and the owner was a RUDE RUDE RUDE RUDE, telling me that he can't sell it to another customer so he wouldn't give me my money back. he said that he didn't know what I did to it because i'd taken it out of his fish market. frankly, he shouldn't have sold it to anyone else. it WASN'T FRESH as he told me on the phone an hour earlier. the sushi is fair, but the market part is unacceptable and the owner's customer service crappy. i'll never go back even though i used to like them.